By @SimonCocking. Available from Amazon here. A COLLECTION OF PROBLEM-SOLVING TOOLS, GAMES AND TECHNIQUES USED BY BRAINSTORMERS, GAMECHANGERS AND TRAILBLAZERS. 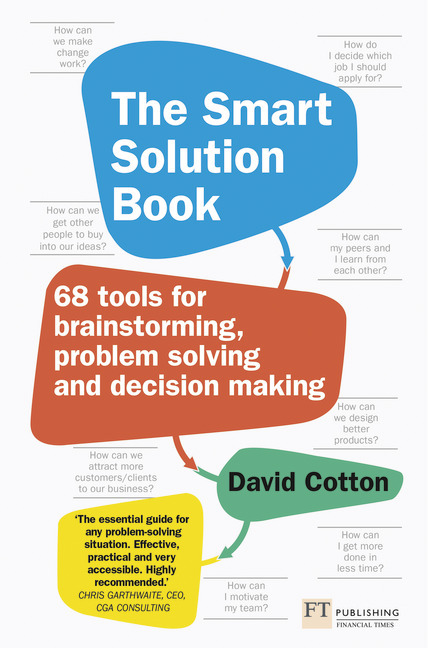 The Smart Solution Book explains each tool in detail – what it is, when and how to use it, its strengths and its limitations. The tools range from quick fixes, which can be used by someone working alone, to large scale solutions which can be used by groups of 100 and more. You can also use the tools separately or in combination with each other. This book is a useful guide to looking at ways to do things better. There are some good insights, and interesting methods to try out. It’s also a useful consideration to not fall into a comfort zone and keep using the same tools each time you want to do something creative, to get people out of their usual ways of doing things. The challenge perhaps, is that, with a book naming 68 tools, that is a lot to consider, probably more than you will be able to remember to refer to. For this reason you will need to read the book thoroughly, taking notes, to make sure that you have thought about which ones might work for you, and to then remember what they were. I found the book useful, and will be a good resource. After a while the list of ideas began to feel a little relentless, with some only described briefly before moving on to the next one. I began to yearn for a little more explanation around each one, and perhaps some deeper insights into an occasion when it did, or didn’t work well. The good thing is you do get the impression Cotton has learned from experience in delivering these activities and overall this book would be a good tool to have in the bag when looking to keeping challenging teams and individuals to discover and express their creativity and innovative thinking as often as possible.